The potato section at the North Market Produce stall. 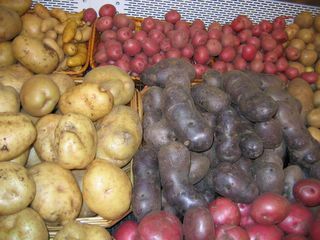 The blue potatoes share space with Yukon Golds, red potatoes, the usual russets, fingerlings and ping-pong ball sized new potatoes. Which is evident by my general size and shape. I am not small. Potatoes will do that to a person. Give you substance. They are the perfect peasant food, and I grew up eating like a perfect peasant. Meat, potatoes and vegetables. Three food groups on the plate. Sometimes, we had bread, too, but there were always potatoes, even if we had biscuits, cornbread or dinner rolls, potatoes were ubiquitous. The best potatoes were the ones Grandma and Grandpa grew. His favorite variety was the Kennebec, but I also remember him growing the Irish Cobbler, too. But he would hold forth at the dinner table about the good qualities of the Kennebec, while the rest of us shoveled many ounces of said potatoes into our gullets. My Gram, Dad’s mother, on the other hand, preferred red potatoes. Hence, her mashed potatoes had a different texture than Grandma’s who always used russet-type potatoes, which have a drier, mealy texture that sheds moisture. I learned early on that the texture of Gram’s mashed potatoes was silkier and more moist, in part because she used real butter and half and half in hers, but also because the red potatoes are a waxy potato with a starch structure that holds onto moisture. Also, Gram used a hand potato masher, vintage from the 1920’s–a steel disk with stars cut out on it with a steel stem growing up from it perpendicularly, with a green–painted wooden handle that fit perfectly into her palm. She was very thorough in her mashing and beating, but there were always small lumps that escaped her ministrations, and Gram always said that was how you could tell they were real. Grandma’s potatoes tended to be lighter and fluffier, and were always perfectly smooth. She whipped hers up using her old Sunbeam stand mixer, and she served them on the table right from the heavy glass mixing bowl that went with the mixer. She used milk, sometimes evaporated milk, and margarine in hers, and the flavor of the home grown potatoes really shone through the minimal enhancements. I wonder what my Grandpa would have thought of blue potatoes? He didn’t much care for the red ones; he didn’t like the waxy texture or the sweeter flavor. I suspect that not only would the unusual color of blue potatoes put him off, but the slightly sweet flavor would distress him, too. He always said that potatoes should taste like the earth they grew in, and that when we ate them, we were eating the land itself. I reckon he might say that there must be something wrong with the land if the potatoes are purple. 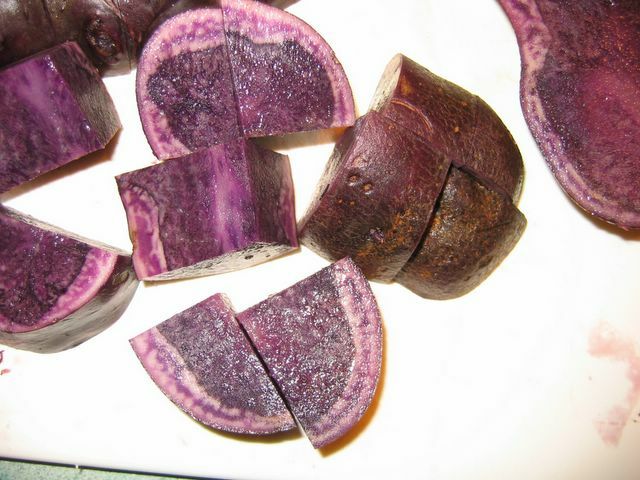 For, indeed, blue potatoes are really purple, once you cut into them. The vivid violet color of the raw potato fades to a medium blue when cooked. More color is retained if you cook the potato whole, as the pigments which make the potatoes such a rich royal purple, anthocyanins, are water soluble. They tend to be concentrated in the cell vacuoles, so if you cut the potatoes and damage the vacuoles, the color leeches out. In addition, the vacuoles which store anthocyanins tend to be acidic, and most tap water used for cooking is slightly alkaline; in an acidic environment, the anthocyanins tend towards the red area of the spectrum, while in an alkaline environment, they tend more towards the blue-green coloration. So, if you cut up your blue potatoes and cook them in regular tap water without adding any acid, not only do you lose a significant amount of pigmentation to the water itself, you also change the color by virtue of a loss of acidic environment. When cooking purple vegetables like say, red cabbage, it is traditional to add an acidic ingredient like vinegar (sweet and sour cabbage, anyone?) in order to keep the cabbage reddish purple, rather than have it turn a kind of greyish blue, which is not an appetizing color. I suppose you could do the same with blue potatoes, but I have found that simply boiling them whole helps retain a lot of the color, though it does fade to a more pale violet color rather than the bold royal violet hue of the raw vegetable. If you are wondering why I know so much about plant pigments and the chemistry of cooking, you can thank Harold McGee, author of On Food and Cooking and The Curious Cook. He is one of my favorite authors; a chemist by profession, he has unraveled the mysteries of cooking and baking and has written the best tome to explain the science of the kitchen to lay persons I have ever read. And believe me, I have read all of the popular books on the subject, and his is the most complete and sensible of the lot. Besides, he is fun to read, and his works have singlehandedly made me a much better cook than I would ever have been without reading them. His books should have been required reading in culinary school; I found my knowledge of his work invaluable when navigating the perilous shoals of baking and pastry classes. It also helped when it came to vegetable cookery; my vegetables were consistently prettier than other students, and I have McGee to thank for it. Which brings me to the question of what exactly does one do with blue potatoes? Well, I like to make violet color mashed potatoes with them, but they are a bit shocking on the plate. Especially so for guests who are not used to my fits of culinary whimsy where I cook up a bunch of weirdly colored things and present them together. Some folks use them in potato salad, and I think that so long as you didn’t use a mustard-based dressing, that would be great; a German potato salad made with them and some Yukon Gold potatoes would be striking. My very favorite use for them is in Indian cookery, most specifically in a dish of potatoes cooked with spinach, called Saag Aloo. In many restaurants, saag aloo is a very creamy dish, with pureed, somewhat overcooked spinach in a somewhat spicy dairy-based sauce, with chunks of boiled white potato dotted throughout. I make mine differently. I generally start with carefully browned thin slices of onion and garlic cooked until golden. Then, I add ground spices, and cook until they are fragrant, then add the spinach, which I have thawed and squeezed the excess water from. I turn up the heat and add a bit of yogurt and a tiny bit of cream, just to bind it together. 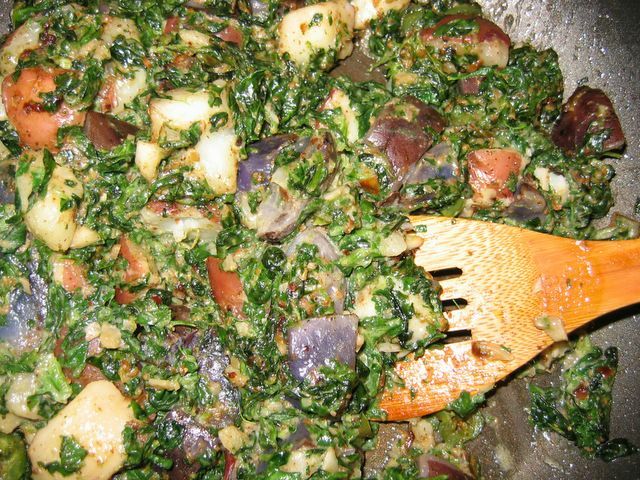 Potatoes which I have cooked separately whole, are drained, cut up into dice and added, and the entire dish is cooked down until the still vibrant green spinach clings to the potato chunks, and the spices are married together into a melange of subtle flavors. Sometimes, chopped fresh mint is added at the last minute as a garnish, and I usually use it as a dish alongside something a bit spicier like a vindaloo or a korma. I find that using a combination of red-skinned white potatoes and purple potatoes really makes the dish turn out beautifully, and makes it seem as if it tastes even better. The jewel-like colors are at home on a plate of Indian food; it makes me think of the gorgeous silk saris and the polychromatic painted statues of Hindu deities bedecked with flowers that are venerated with food offerings in the great temples and houses of the faithful. The dish is like a green field dotted with white and purple wildflowers, and that visual ideal only helps boost the mingled flavors of the vegetables and spices. Blue potatoes add color interest to a dish of Saag Aloo. After the potatoes are finished cooking, drain and cut into a medium dice, and set aside. Heat ghee and vegetable oil in a heavy skillet. Add onions and cook, stirring constantly, until they are medium brown. Add garlic and cook, stirring constantly until garlic is golden in color and very fragrant. Add spices and cook one minute more, until the air is strongly scented. Add spinach, along with yogurt and the smaller amount of cream. Add potatoes, and salt to taste and cook, stirring, to reduce sauce until the liquid is almost gone and the very green spinach clings to the potatoes. If you wish, you may add a bit more cream to make the dish a bit more moist; I prefer it nearly dry. Salt carefully; you can easily over salt if you salt it to perfect taste while there is still a lot of liquid. Under-salt at first and then reduce the liquid by simmering it off, then taste again and correct the salt at that time. You can cook this ahead of time and set on a cold burner if you need to, then reheat gently with another bit of cream or some milk, until it is sufficiently hot. This has the effect of deepening the flavors, and so long as you take care not to overcook the spinach, nothing is harmed, and in fact, the dish is improved in this way. I enjoy your blog very much–you write in an approchable and enthusiastic voice. The bread one was particularly appealing. I also like potatos. I like the little red ones, and the waxy banana-shaped ones. I make mashed potatos with skins (to show that it’s real), a masher, and butter. I’m going to try the recipe out, although I have a non-adventurous eater for a husband. I see from reading your comments that you have another friend who’se name is Judith–not a common thing at all; so I added the ww to diferentiate. How much vinegar in the cook-water of the red cabbage to preserve the colour? If I steam it can I sprinkle it with vinegar? Hey Judith! Yeah, I have two Judith friends and an Aunt Judy and my Mom’s name is Judy. Weird, huh? A tablespoon or two of lemon juice in the water will help; if you steam, use a non-metal steamer basket and squeeze the juice of a lemon over the cabbage to retain color. Also–if you can cook in an enamelled or non-metallic pan, it will also help retain anthocyanin color in your fruits and vegetables. That’s the prettiest saag aloo I’ve ever seen. I think I need to pick up some potatoes at the farmers’ market tomorrow and try this. It all comes from not overcooking the spinach. The dish looks especially well on a plate with a rice pillau colored yellow with turmeric and a reddish or orange colored dish like vindaloo or rogan gosht. With Indian foods, I really like the colors to be vibrant, so some things I cook less than many Indian cooks do, and I do what is authentic and serve a lot of fresh chutneys alongside. I also do things that are untraditional, like putting fresh mango cubes into a vindaloo at the last minute as a garnish or sprinkling fresh pomegranate seeds over a dry cooked meat cube dish like bohti gosht along with chopped cilantro, which is traditional. It is because I am in love with the colors of India–the throbbing hues of Bollywood movies, the scintillating silk and cotton dyed saris and lengha-choli dresses, the shades of flower petals used in rangoli…it is all delectable to me. So, of course, when I cook Indian food, I want my plates to reflect that color bounty. My non-adventurous husband will not eat turmeric, but you can get the same effect(although not taste) with calundula petals. I grow them, so they would probably grow anywhere. The Saag Aloo looks beautiful – I haven’t ventured much into the land of Indian cooking, but this sounds delish! And potatoes, mmmm! When I was in Bolivia they had the most adventurous colors and shapes and sizes of potatoes I’ve ever seen – your first picture immediately made me think of all the little stalls with the little women in their bright clothes selling just as bright potatoes in the thin air – thanks for bringing the image back to me! I’ve used blue potatoes in a gratin dauphinoise (that is the name of the one with all the cream, right?) It was superb, and the color really got to shine through! I also found the texture of the blue potatoes to be really nice in the gratin. Ah, if only we’d have blue potatoes this season! Great post! The range in colors, shapes, textures, sizes and flavors of potatoes is amazing, and I could probably do several more essays on the topic easily. I should like to see the vendors in Bolivia–the colors of food and clothing always attract me and affect me deeply. That gratin sounds lovely–I will have to try it when next I get my hands on some blue potatoes. Calendula grows here, too, Judith–but my favorite edible flowers that I grow are nasturtiums, pansies and viola, roses and lavender. I grow lots of those every year and use them as garnishes and in salads. Oh man…my husband’s grandparents grow kennibecs. Some of my fondest memories as a newlywed are following Grandpa on the tractor in the “family” garden. All the brothers and sisters, nieces and nephews scrabbling to pick up those tender brown ‘taters. My nephews jocking to get the big ones first in a crazy potato race. Grandma following a row or so behind and cheerfully cat-calling as she picked up missed potatoes and the tiny little potato balls the kids didn’t think worthy of going into the buckets. Hot, dirty, dangerous work with the fire ants swarming from their newly plowed-over mounds…frying up those fresh from the dirt potatoes as my husband washed off the dirt and chiggers. Nothing tastes like that. Nothing. We lost Grandpa at the age of 97 this last December. My sister-in-law and her husband planted the potatoes for the family this march. My nieces and nephews are all grown, and great-great-grandchildren will toddle between the plowed rows this June as Grandma (an active 95) teases them about leaving so much un-picked in their rush.